The Regional Administration Office was destroyed in an incendiary attack by protesters in Dhankuta Thursday. KATHMANDU, Jan 19: Massive protests erupted across the country on Thursday, a day after the government announced temporary provincial capitals. 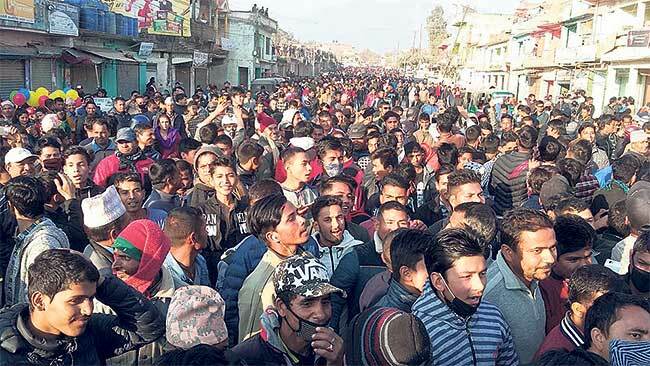 Angrered by the government's decision, agitating residents in various districts have intensified their protests Thursday demanding to locate of the provincial capitals in their areas. Dhankuta, Dharan, Doti, Banke, Parsa and Dang districts were among the most affected by the protests on Thursday. Local Administration Office, Dhankuta clamped a curfew for an unlimited period from Thursday after protests went out of control after the government named Biratnagar as the capital of Province 1. 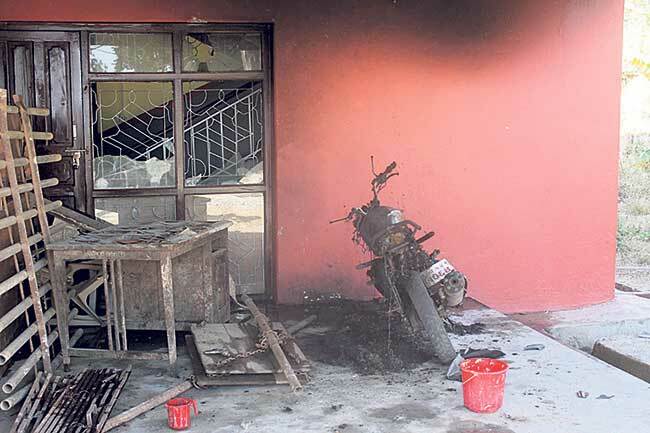 District residents vandalized and set fire to government offices, vehicles and marketplaces, leading to clashes with security personnel, informed Dhankuta's Chief District Officer Prem Prakash Upreti. 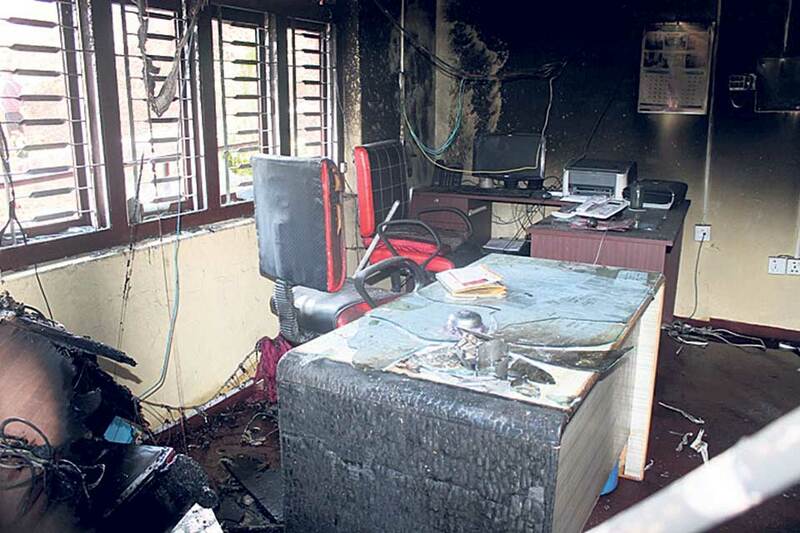 Regional Administration Office in Dhankuta was also set on fire by protestors. The fire destroyed the office furniture, computer and documents. Likewise, they also vandalized the Land Revenue Office, Post Office, Dhankuta-bench office of the High Court of Birtnagar, and Urban Development Office among others. 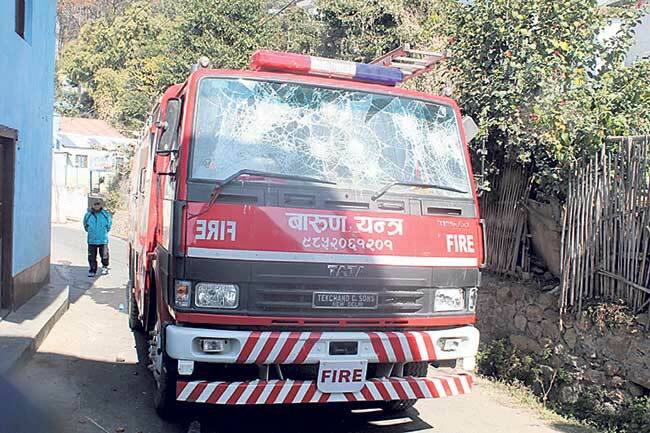 Likewise, protestors also vandalized a fire engine of Dhankuta Municipality that was on its way to douse fire. An ambulance (Ko 2 Cha 432) and a motorcycle parked inside the Urban Development Office were also vandalized. Police personnel clashed with protesters at Bhim Narayan Chowk, Madan Chown and Regional Administration Office. Seven protesters including Nepali Congress treasurer of Dhankuta chapter Dinesh Rai, were injured. Rai required five stitches in his head following the injury. 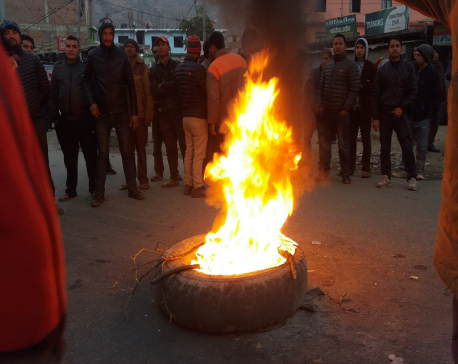 Protesters burnt a government motorcycle at the Urban Development Office in Dhankuta on Thursday. After protesters started setting buildings and vehicles on fire in the morning, Superintendent of Police (SP) Sudeep Raj Bhandari of Dhankuta District Police Office (DPO) himself arrived at Dhankuta Bazaar to arrest protesters. The irate protesters then vandalized the police van used by SP Raj Bahndari. Tension flared after police confronted and tried to arrest the protesters who were enforcing closure of transportation and marketplace and vandalism. Following the incident, security personnel have been deployed in large numbers. Koshi Highway remained closed. Life in the district has been adversely affected due to the protests, which is ongoing since the last 34 days. The situation in Dipayal of Doti district also took a bad turn on Thursday. Police lobbed tear gas shells to disperse angry protestors leading to 13 injuried on both sides. Deputy Inspector of Police (DSP) Shiva Bahadur Singh of DPO, Doti, informed that 13 rounds of tear gas shells were fired. Protesters in Dipayal burn Prime Minister Sher Bahadur Deuba in effigy to protest the government decision to name Dhangadhi as the temporary capital of Province 7. Protests in Dipayal have gone out of control ever since the government announced Dhangadhi as temporary capital of Province 7. The demonstrators pelted stones at Regional Administration Office and tried to set it on fire. However, the attempt was foiled by police who used tear gas and batons to disperse the angry mobs. DSP Singh said nine police personnel were injured in the confrontation with the protestors. He added that their condition is normal. Likewise, four protestors sustained injuries in the clash. The situation of one injured, Bharat BK of Dipayal Silgadhi Municipality-4, has been reported to be critical. He has been referred to Seti Zonal Hospital in Dhangadhi for further treatment. Protestors also vandalized a traffic check post in Rajpur of Dipayal and set ablaze a motorcycle belonging to the District Forest Office in Silgadhi. Irate cadres of the ruling Nepali Congress (NC) hoisted a black flag at their party office. They also burnt effigies of Prime Minister Sher Bahadur and his wife Arzu Rana Deuba on the office premises. Protesters in Dadeldhura district also burnt an effigy of Prime Minister Deuba in the afternoon at Bagbazaar, the district headquarters. 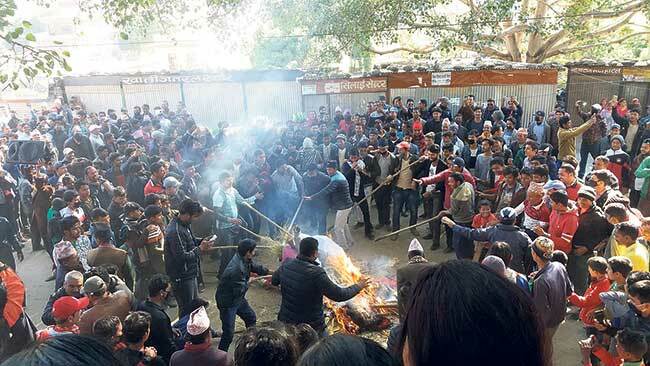 Protesters led by Prakash Saud, central member of the Federation of Nepalese Chambers of Commerce and Industry, burnt the effigy of Prime Minister Deuba, who is also the president of the ruling Nepali Congress, in the leadership of Prakash Saud. Meanwhile in Dharan, a struggle committee formed with the objective to create pressure for declaring Dharan as the capital of Province 1, has postponed its month-long relay hunger strike on Thursday. The committee declared peaceful protests instead. Nonetheless, violent activities like vandalism and strike have been observed in Sunsari. A rally was organized in Dang on Thursday demanding that their area be declared the capital of Province 5. 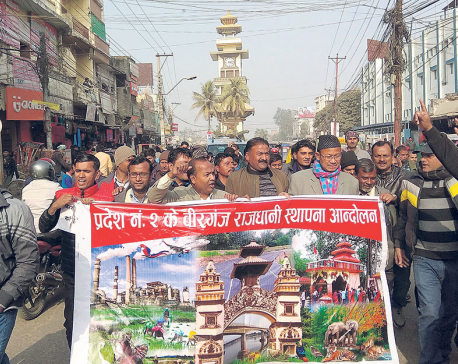 Meanwhile, politicians and civil society leaders in Nepalgunj have threatened to secede from Banke district if the district was not declared as 'permanent' provincial capital. Former Minister and parliamentarian Mohammad Estiyak Rai, parliamentarian Nanda Lal Rokaya, provincial legislator Surendra Lama, among others threatened to intensify the protests if their demand was not met.